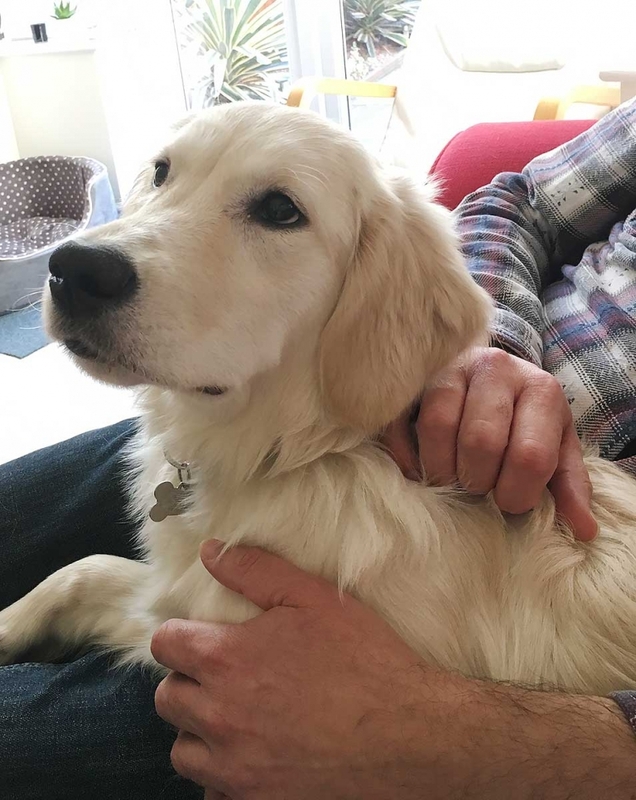 Simon has been visiting this gorgeous six month old Golden Retriever for twice daily home visits after she was spayed, as you can see she has been getting lots of cuddles during this time. As well as dog walking we offer home visits for dogs and other pets, in the past this has included cats, rabbits, guinea pigs, ducks and chickens. Please do not bring your dog on this walk as it will disturb the seals. 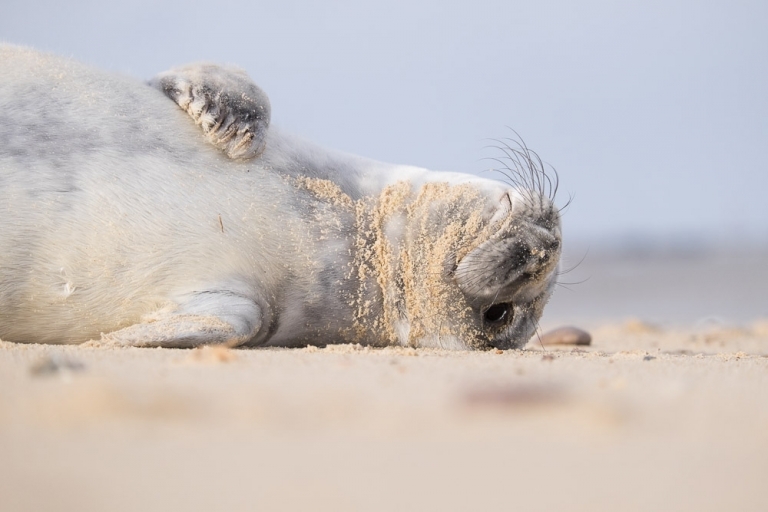 In late October to February each year, seals come onto the beach at Horsey Gap in Norfolk to have their pups. It’s about two hours drive from Higham Ferrers to Horsey Gap. 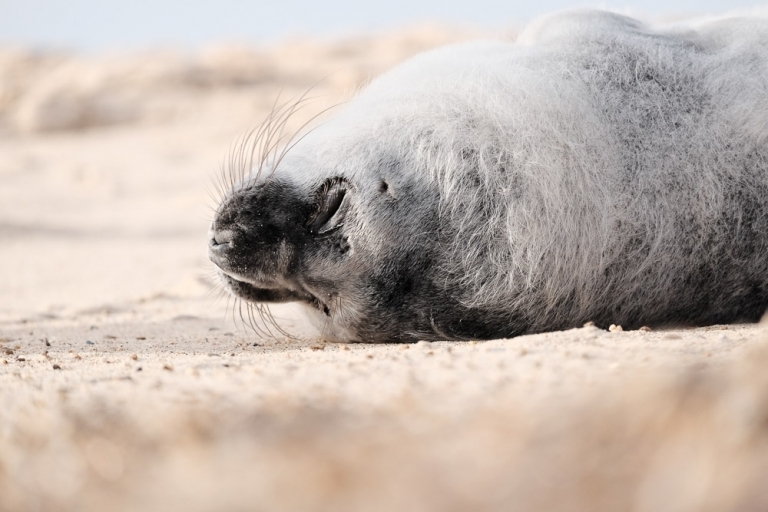 The best time to visit is late December/early January when you will see many seal pups on the beach. There is a car park (parking charges apply) right next to the beach, bring wellies or walking boots as they paths tend to get very wet. It’s best to avoid the Christmas period as the number of visitors gets very busy. 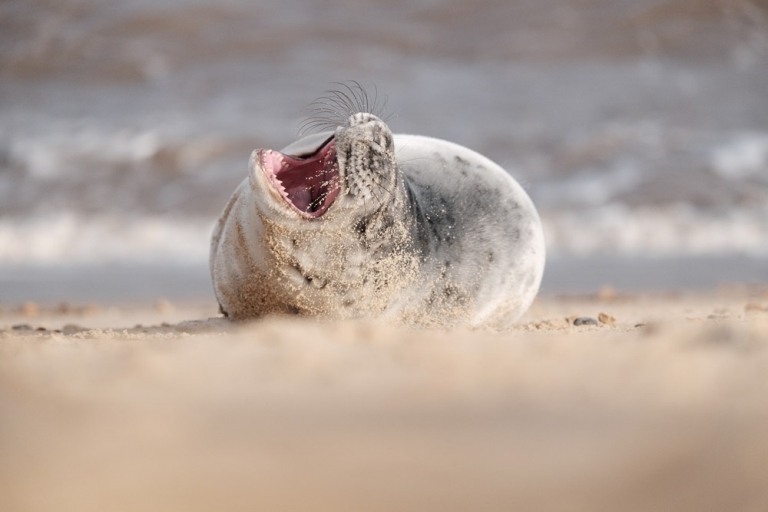 There is a viewing area roped off on the top of the sand dunes giving a good view across the beach, you are not able to access the beach for the welfare of the seals. However if you park further up the coast there are no such restrictions and seals can be spotted all along this stretch. Please respect the seals and do not approach them too closely, these photographs were all taken with a 400mm lens from some distance away. Winter dog walking brings it’s own challenges, the days are shorter & the weather is often cold and damp. My own Golden Retriever likes to explore the muddiest sections of my garden before heading back in to carpeted rooms. A trick I have found is to stop her at the door with a treat and then dry off her muddy paws before she has a chance to leave footprints all over the carpet, otherwise she will happily run in from the garden and turn my carpets brown before I’ve had a chance to dry her. Please make sure you leave out a towel that I can use to dry your dogs paws with before they walk over your carpet, a mat by the entrance door also helps with this. On the plus side the days are now getting longer and I’m looking forward to spring walks. For many people a dog is an extension of their family, so it seems natural for some to include their dog in family events. Weddings are no exception to this and it is becoming more popular to have your dog at your wedding. Sometimes the dog even takes an active roll in the day by being the ring bearer. A few things need to be considered when deciding to take your dog to a wedding (be it your own wedding or a family wedding), firstly you’ll need to make sure your dog will be welcome at the wedding venue, then think about who will look after your dog on the day while you have your hands full. There are a few practical things to think about too, muddy dog paws and white wedding dresses are not a good mix! There are lots of food smells at a wedding too, not to mention cake! If you think it might all end up in tears you could always bring along a life size cardboard cut out of your dog instead. © 2019 Walkies – Higham Ferrers & Rushden dog walkers.